Demi Lovato has been quite outspoken about her affection for jiu-jitsu among other things. The young pop star has taken a liking to a variety of mixed martial arts and can be seen around the web hitting takedowns on her instructor, working on technique and striking among other things. The fitness routine that has her feeling so strong and confident? Mixed martial arts and jiu-jitsu, she tells. Lovato — who overcame past issues with bulimia and body image — says exercise is vital to feeling good.. Lovato eventually checked into rehab at age 18 to deal with her eating disorder, cutting and substance abuse issues. “I work out personally because of the way it makes me feel and the release of serotonin. It’s important to take care of yourself physically but also mentally as well,” she says. New to BJJ? You MUST watch this video! I've been on the mats 3/4 of my life and have learn tremendous amount of life skills on the mats. The mats (especially in BJJ) teaches us that nothing comes easy and every bit of it is earned through hard work just as in the real life. But just as in the "real" world we all need nurturing and guidance on the mat. As an instructor or high rank student of the academy one may tend to give more attention and guidance to the newer students that are more "physically gifted" and can understand the techniques and the concepts better but what happens to the everyday Joe and Jane that is also on the mats? a lot of times they get over looked and little guidance is given to them. I don't know about you but the "physically gifted" students will find a way to keep up with the class while the average Joe and Jane may not. Just as a child growing up into pre teen, teen and eventually adulthood we need to be there to guide them into positive direction. There is no difference on the mat, all upper rank students and instructors should pay more attention and guide the everyday folks who are there to better themselves through Brazilian Jiu Jitsu. Remember, we are all in this together and if your teammates are improving, YOU are improving. 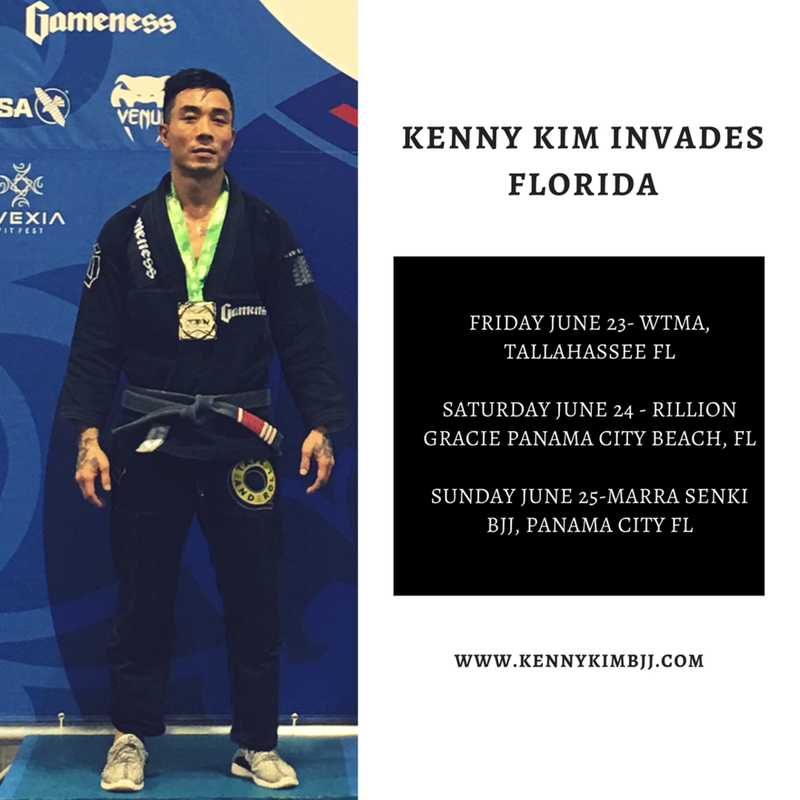 Ares BJJ-Kenny Kim , Prof Kenny's Promotion, Belt Ceremony, Newest Black Belt, and Party! This weekend was jam packed with lots of exciting news around the academy! We are now officially a part of the growing Ares BJJ association. Founded by good friends Samir Chantre, Osvaldo Queixinho Moizinho, Milton Bastos and Alan Moraes of Brazil. This is great for us to have the full support of best non politic jiu jitsu team in the world! we can't wait to see what the future holds for us. Congratulations to Kenny Kim BJJ's first Black Belt Brien Calloway and on Prof. Kenny's promotion to second degree black belt. 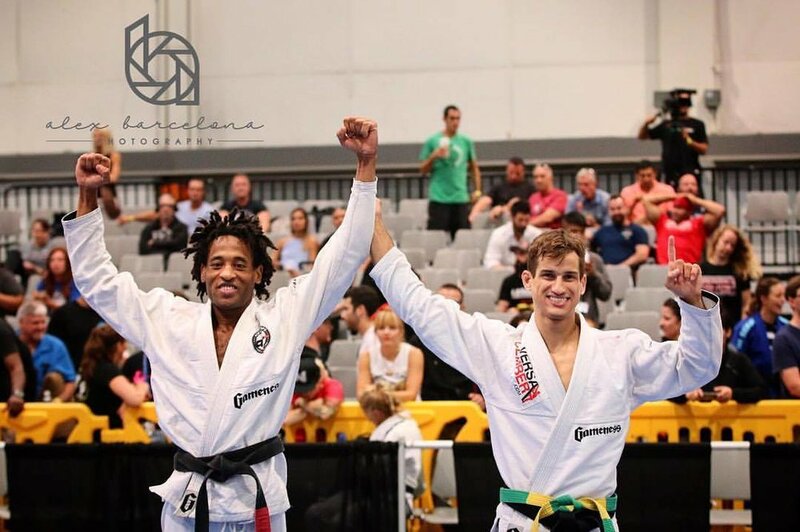 Both of these gentlemen embody to essence of jiu jitsu and we couldn't be happier for their success!! We'd also like to congratulate everyone who received new stripes and belts this past weekend, your hard work and dedication has paid off! stay on the mat and keep training hard! Thank You all who supported and attended the seminar taught by Samir and Quexinho. We hope you picked up some cool techniques and concepts and really appreciate the support. Next we will be hosting the ATL Open (Fall) camp with multiple black belts and team mates. We enjoyed the Brazilian Samba show by Dance Brazil. It was a spectacular show and we all enjoyed it!! Don't forget we are hosting our belt award ceremony and our 11 year anniversary party and we expect to see ALL STUDENTS (kids and adults). We will kick off the event at 10am with all participants being in their clean WHITE gi's. We will award stripes and graduate new belts at this time. It is also a special day because Professor Kenny will be receiving his 2nd degree on his black belt and will be awarding the first black belt from the KKBJJ academy. Team pictures will follow so you don't want to miss out! Please sign up to bring pot luck and share some good food and good times. We will have face painting for kids and a bounce house for them to play on so bring out the entire family! Next, Professor Kenny will be recognize and award some special persons who was a big influence in the growth of the academy these past few years. Lastly, we will finish off the day with an awesome seminar with good friends and teammates Osvaldo Queixinho and Samir Chantre at 1pm. These guys aren't just good jiu jitsu competitors but all around great people on and off the mat. If you met and trained with them before you know what I'm talking about, if you haven't here is your chance! Go to STORE and pre register for this event! We know you brag and talk about training Jiu Jitsu to your friends all the time so why not bring them with you to try out a free class? If they are a friend of yours they will be a great fit for the academy. Kids can bring their buddies any weekday during class and adults can bring their friends to the BJJ 101 class (unless they experience then they can attend any class on schedule as long as your with them) Not only is it fun having your friend train with you but to show appreciation we will pay for your next months tuition once they become a member. We hope to see many new faces around the academy! Share the love! Social Media is great way to let people know what you are up to so why not let them know you are training BJJ? When you come into train we'd love it if you could "check in" on Facebook or on Instagram. Take a photo or video and let your friends and followers know what your up to. Make sure to #hashtag #kkbjj #kennykimbjj We love hearing success stories about our students! Are you tired of doing laundry every night? Do you spend too much time waiting on your gi's to wash and dry? well.. we have a solution! We are now offering Gi Laundry Service to all students. Think about it, after a hard training session you drop your Gi off at the designated area and next time you come in your gi is washed, dried and hung! We suggest you at least have 2 gi's in rotation as we have a 2 day turnaround policy. No more hassle of carrying stinky gi's in your car, washing, and sometimes forgetting it. All this for only $20 a month! Speaking of forgetting your gi, you don' have to miss class and go home if you forget your gi. We have a gi rental service for only $10. If there is ever a time you misplace your gi or is not clean and want to train we got your covered! I get asked questions all the time "how can I get better at jiu jitsu?" or "what do I need to work on to be better at...?" These are very common questions and I respect the question and their dedication in wanting to get better and be the best they can be. I have been doing this for a very long time and I sometimes have these questions but the truth of the matter is that there is no 1 technique or 1 thing you can do to improve your jiu jitsu. Well.. I take that back! there is one thing you can do to improve your jiu jitsu and it may not show immediately but in the long run you will be better than where you were and better than anyone who has quit or given up. JUST SHOW UP TO TRAIN AND STAY ON THE MAT! I have seen so many talented jiu jitsu guys stop training because of whatever the circumstance are and end up regretting their poor decision. It is also harder for you to come back on the mat after a long hiatus due to the fact everyone else is now "tapping" you. So at the end of the day there is no secret to getting good at jiu jitsu if you show up and train you too will be good and reach the ultimate goal of Black Belt. We all have busy lives and expenses but its how you prioritize what's important in your life.